Canadian gun-launched orbital launch vehicle. When compared to the early Martlet 4 designs the GLO-1B was a considerably more sophisticated vehicle with many of the shortcomings of it's predecessor having been addressed. Not long after the original HARP project ended the major assets of the project were acquired by the projects management, Dr. Gerald Bull in particular. The HARP Program became the Space Research Corporation (SRC) with the intention of resurrecting the HARP orbital program. Over the years a much improved and considerably more sophisticated Martlet 4 was developed and given the name of GLO-1B. Status: Development ended 1966. Payload: 23 kg (50 lb). Thrust: 32.00 kN (7,193 lbf). Gross mass: 900 kg (1,980 lb). Height: 5.10 m (16.70 ft). Diameter: 0.42 m (1.37 ft). Apogee: 425 km (264 mi). In general the GLO-1B was similar in appearance to the Martlet 4 although there were several modifications to the original design intended to improve the vehicle's performance. The major differences were that the overall length of the vehicle was shortened and the launch mass was reduced. The satellite payload mass was similar to the Martlet 4 with an initial minimum 50 pound satellite. Improvements in the gun-launch velocity alone (such as lengthening the gun from 120 feet to 240') could have been increased the payload mass to nearly 100 pounds The rocket motor cases were to be made from aluminum rather then Fiberglas to simplify manufacturing. The first stage of the GLO-1B was shortened from 156 inches to 92 inches . The fuel weight was reduced to 1100 pounds and the overall weight to 1308 pounds . The GLO-1B used the same basic six flip-out fin design of the Martlet 4. The general design of the rocket motors changed little. The most notable exception was a modification to the rocket nozzle assembly. The rocket motors of the Martlet 4 used a very conventional design with the rocket nozzle extending out of the base of the motor. With the GLO-1B the base of the rocket nozzle assembly was flush with the bottom of the rocket motor case and the throat of the nozzle projects into the motor and was surrounded by the rocket fuel. This helped reduce the overall length of the motor, and greatly reduced the complexity of the inter-stage adapters, as the motors could literally be stacked one on top of the other. The second stage of the GLO-1B was reduced from 52 inches to 51 inches . This motor used an internally positioned rocket nozzle similar to the first stage and retained a similar propulsion profile to the Martlet 4B stage. The third stage of the GLO-1B was shortened from 48 inches to 18 inches with a fuel weight 140 pounds and an overall weight of 165 pounds . The third stage's rocket motor case was spherical with an internal rocket nozzle that protruding only slightly from the case. There was also a liquid propellant motor considered for this stage, similar to the Martlet 4 third stage, which would have provided higher performance and allowed a heavier satellite to be flown. The insert motor was considered the fourth stage and was incorporated into the satellite payload in the same manner as the Martlet 4. One of the most notable differences between the Martlet 4 and the GLO-1B was the elimination of the Attitude Control Module between the second and third stages. A dedicated Attitude Control Module was eliminated by modifying the flight profile of the GLO-1B vehicle. The Martlet 4 vehicle used the Attitude Control Module to insure the pitch and yaw of the vehicle was within set parameters prior to the ignition of the second and third stages. With the GLO-1B this was simplified by modifying the mission sequence which made it necessary to provide attitude control for the third stage only. The first stage of the GLO-1B was unguided and, in the same manner as the Martlet 4, relied on both spin stabilization and the fixed geometry of the barrel to insure a predictable flight path prior to first stage ignition. The Martlet 4 flight profile specified a delay between the first stage burnout and second stage ignition during which the Attitude Control Module was activated to insure the vehicles orientation was correct prior to the second stage burn. The GLO-1B eliminated this delay and the need to re-orient the vehicle by igniting the second stage immediately after first stage burn out and separation, which allowed the second stage to share the first stage's orientation. A simplified attitude control system was incorporated into the satellite payload and was used to correct the vehicle's attitude prior to the third stage burn only. As part of the satellite payload it could also be used to orient the satellite vehicle for the orbital insertion burn to insure that a precise orbit was achieved. Once in a final orbit the attitude control system could be used to reorient the satellite for functions such as antenna or sensor pointing. Along with the GLO-1B launch vehicle an initial satellite vehicle was designed which would fit into the vehicle's 40 inch long ogive nose cone. The initial satellite's payload was little more then a transmission repeater which was similar to many amateur satellites in orbit today and would have demonstrated that the launch system worked as planned. The basic sub-systems of the satellite would have been a beacon transmitter, a command receiver, a command logic module, an attitude control module and an active repeater/transponder. The satellite body had an overall length of 24 inches . The primary payload section of the satellite was a decagon 14.5 inches across and 9 inches high. The base of the main section had an integrated 12 inches diameter high gain dish antenna and the exterior was covered in solar cells to provide electrical power. The upper section of the satellite was an octagon 8 inches across and 15 inches long. The first 3 inches of this section was the primary battery compartment which provided power when the satellite was in the Earth's shadow. The remaining 12 inches of this section was the satellite insert motor. The exterior of this section was also covered in solar cells. During the era when HARP, and later the Space Research Corporation, were developing the Martlet 4, and later the GLO-1B, there was still a prevalent attitude in the space launch industry that satellites and launchers should be ever bigger. New smaller capacity launchers, such the GLO-1B, met with little interest. By the late 1980's and the early 1990's it was realized that the costs of huge satellites was becoming unmanageable and policies such as NASA's smaller, faster, better began to gain acceptance. Today attitudes have changed substantially and satellites in the range of 50-200 pounds are once again considered useful tools. A published report in 1972 indicated that the launch costs for a GLO-1B would be in the range about $88,000 per flight. In year 2000 dollars this was about $360,000 a flight. With a minimal payload of 50 pounds the launch costs of a GLO-1B would be about $7200 per pound which was within the pricing range of many current launchers. Modest improvements to the gun-launcher, such as lengthening the barrel, could have increased the mass of the GLO-1B's satellite to about 100 pounds . When considering a satellite mass of 100 pounds the proportional launch costs come down to about $3600 per pound which was substantially less then current launchers. Previously mentioned improvements in the vehicle design, particularly the use of liquid propellant second and third stages for the GLO-1B, could have increased the satellite mass even further to some 200 pounds Due to the small size and simplicity of the liquid rocket motors for the Martlet 4/GLO-1B it was considered that there would be little, if any, increase in vehicle costs for the liquid rocket stages. The use of liquid rocket stages in the GLO-1B could reduce launch costs even further to the range of about $1800 per pound. Even though these figures were rudimentary and extrapolated from relatively old information they do show the tremendous low cost potential of gun-launched satellite systems. The ability of the HARP orbital program to launch low cost satellites was well known and was usually the sole attribute discussed when gun-launched satellites were compared to conventional satellite launchers. The real potential of gun-launched satellites was not only their ability to provide low cost launches, but also in their ability to launch a vast numbers of satellites a year. Even though the individual HARP satellites had a modest mass, the system's ability to launch 200 or more satellites a year certainly made up for the smaller payload. As an example, a 200 pound payload launched 200 times a year results in a total launch mass of 40,000 pounds or 20 tons per year. This was the equivalent of more then four Ariane 4 launches, nearly ten Delta 2 launches or one launch of Russia's heavy lift Proton rockets. When additional capacity was required one or more additional guns could be economically installed at any appropriate site around the world. A single 16 inch HARP gun-launcher would be capable of supplying nearly all of the bulk consumables (fuels, water, breathing gasses) needed by the International Space Station or Mir each year. Perhaps one of the most attractive uses of the high launch volume of a gun-launched system would be the ability to assemble a satellite platform in orbit by docking several gun-launched satellites together. In this manner a satellite platform of any size could be constructed and if a particular module fails, or a system upgrade was required, a replacement module could be quickly launched. A platform of this type could be operational for many decades as failed systems could be replaced, thrusters could be refueled and the platform could be expanded on orbit to fulfill new requirements. 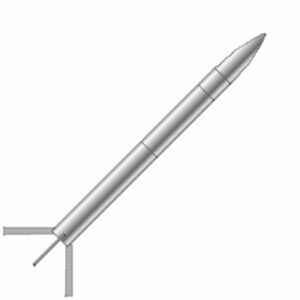 The 16 inch gun system was considered by HARP to be the smallest attractive bore size for a satellite launcher and plans for larger bore launchers, with larger satellite payloads, were under consideration. Larger gun systems could have launched satellites with masses from 500 kg to 1000 kg while still maintaining the low launch costs and high volumes of the 16 inch gun system. Even though the HARP orbital programs never actually culminated in the successful launch of a gun-launched satellite, they successfully demonstrated the potential of gun-launchable satellite systems. Had the development of the Martlet 4 or the GLO-1B gun-launched satellite system proceeded as expected it was quite likely that today the skies would be littered with satellites and that at least a few of the grand dreams of the space colonization from the 1970's may have come true. LEO Payload: 23 kg (50 lb) to a 425 km orbit at 13.00 degrees. Family: Gun-launched, orbital launch vehicle. Country: Canada. Agency: Bull.